I'm taking a break for Christmas for the next week (at least), and I probably won't be posting much (unless something interesting happens). Speaking of something interesting, I am aware that Christiane Amanpour has a special coming out on ABC called "In the Beginning," and I don't know if I'll be able to see it. It strikes me as one of those sensationalistic shows that will annoy scholars, skeptics, and believers alike. So I'm not recommending it, but I would be curious to hear from anyone who happens to watch it. There's this really cool new paper in PNAS that I'm not sure will be celebrated to the extent it should be. 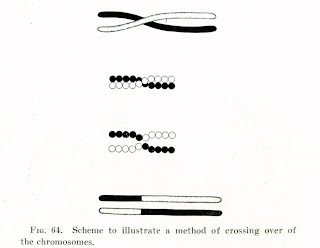 To explain why it's so awesomely cool, I have to explain a little about the fascinating topic of recombination. As you may already know, most multicellular organisms (like me or my cat or the trees in my yard) have multiple sets of chromosomes. I have two sets of chromosomes, 22 regular chromosomes from each parent, an X chromosome from my mom, and a Y chromosome from my dad. That means I have two copies of each gene (except the ones on the X & Y chromosomes), which is really handy in case one of those copies is broken and doesn't work right. I've got a spare that hopefully will. I've heard of studies that estimate that we all carry around a small number of lethal mutations on our chromosomes, but it's not a problem because we've got an extra copy of the same gene that works just fine.